While the hunt still continues for the perfect area rug (I have been to seven different Home Goods in the past two days), I have continued to try to finish off the decorating in the living room. As I mentioned a few weeks ago, our local Ethan Allen is going out of business. Each week they continue to lower their prices. 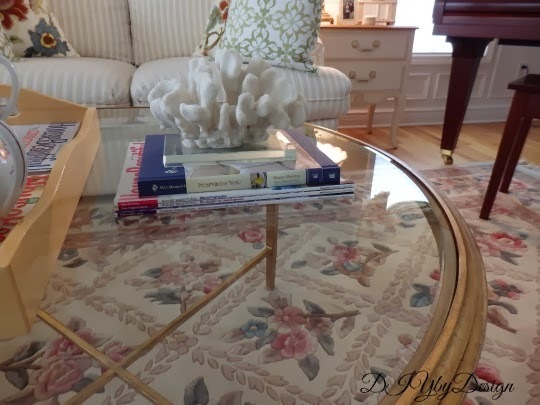 I have had my eye on the Ethan Allen Heron Round coffee table for a while but was waiting for the price to dip to under 50% off. Well a couple of days ago that's exactly what happened. Of course this table only makes me want to change out the rug that much faster. I just love the warmth of the finish on the table and it's lines...elegant but not overdone. 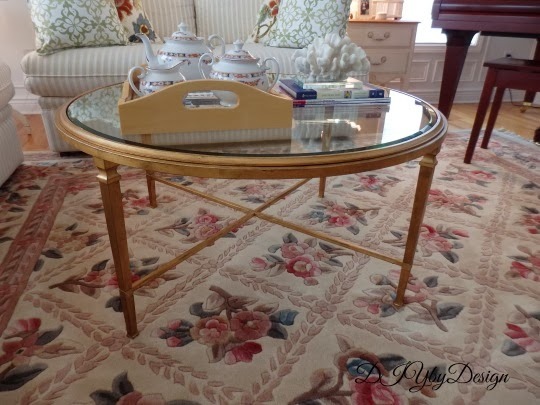 It's so funny...years ago we had a glass and brass coffee table (which we searched the house ten times over trying to find). We have no recollection of what happened to that coffee table. When my son was two years old split his forehead open on another coffee table in our family room and after that I removed any furniture I deemed potentially dangerous to him, including the glass and brass coffee table. He is now 16 and my daughter is 13 so I think it's safe to bring back some "dangerous" furniture. I just love my new table and love even more that it was a real bargain. 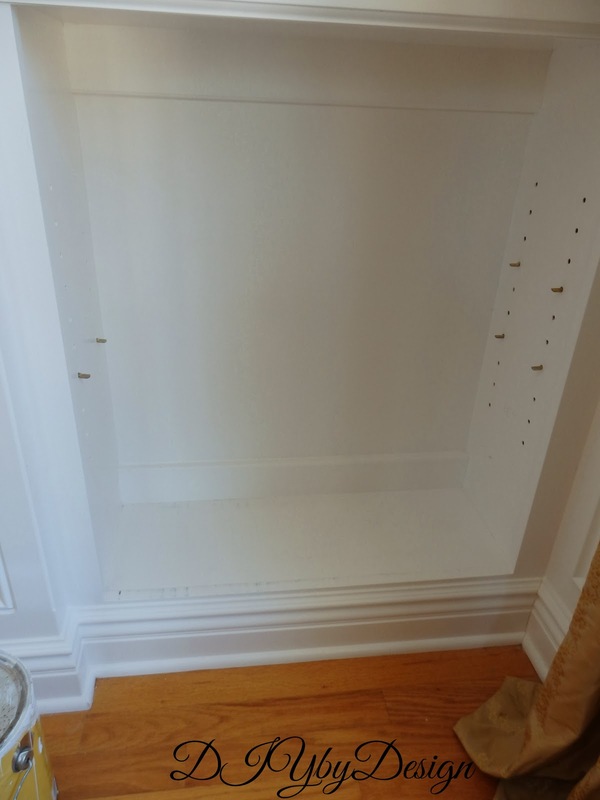 Living and Learning with Luisa shared a mini bathroom makeover. You must check out the before because her mini changes made a huge impact. 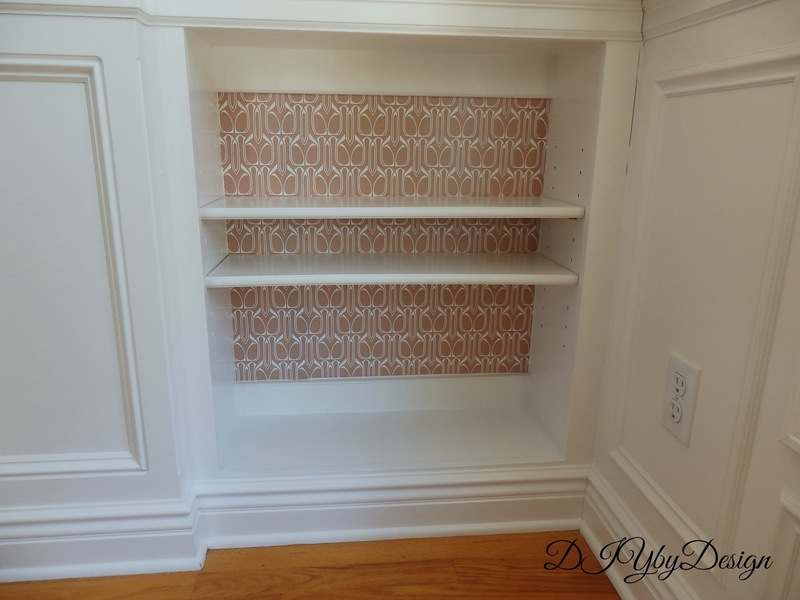 My friend Martina over at Northern Nesting transformed an antique chest using chalk paint. 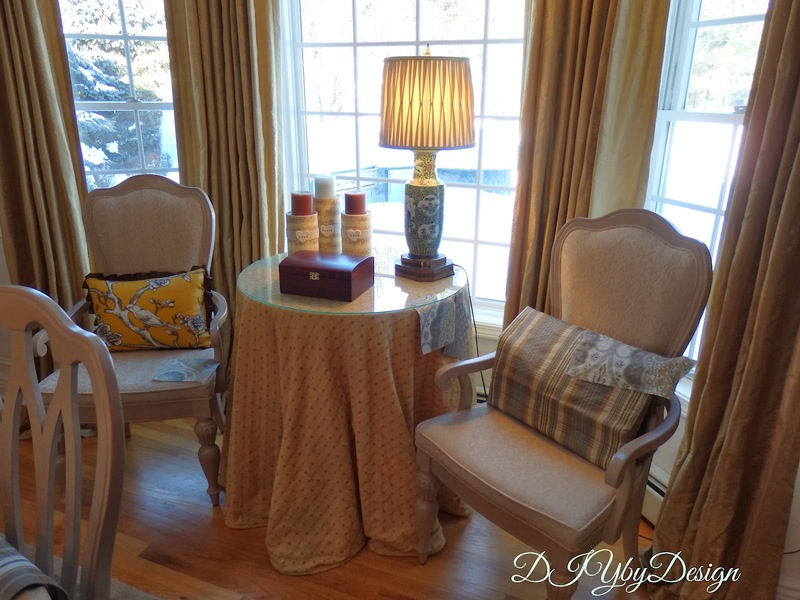 I love the new finish and it looks beautiful in her master bedroom. Rena from Jewelry Making Journal gives a great tutorial on how to create these beautiful and colorful reversible necklaces. 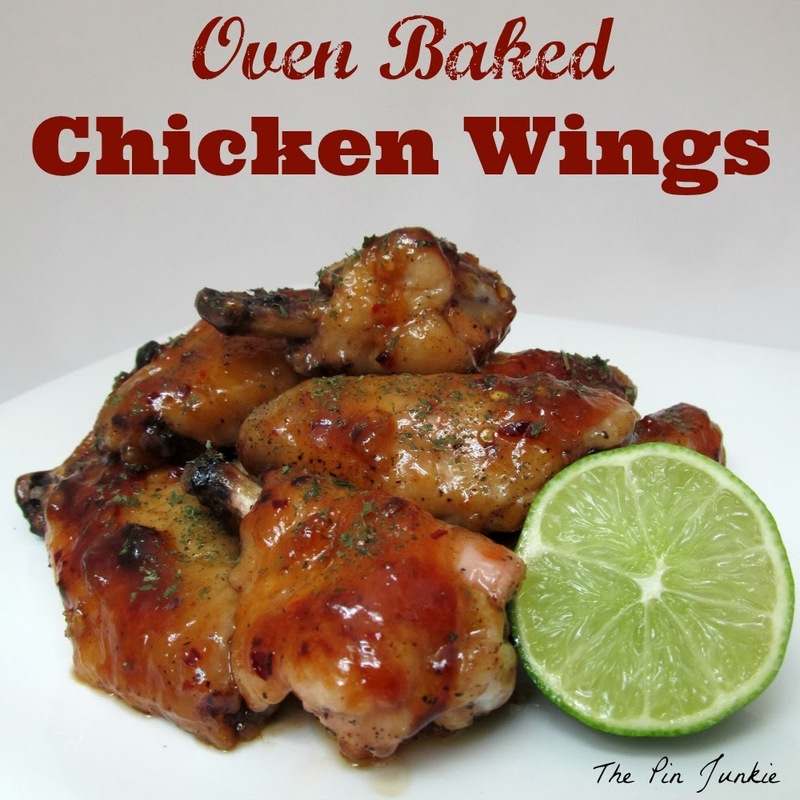 The Pin Junkie shared her recipe for oven baked chicken wings. Those look so yummy! 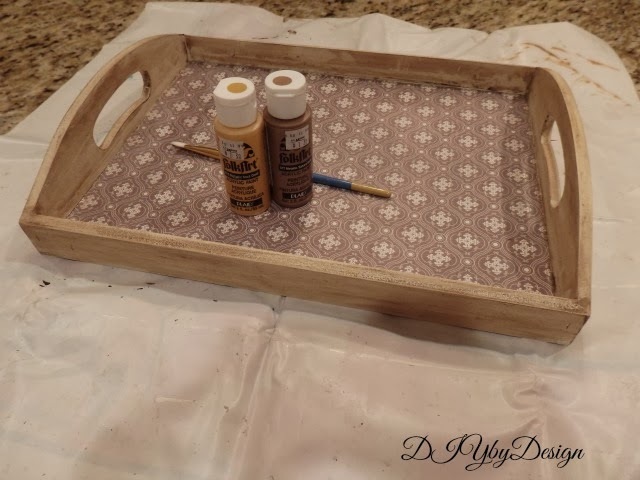 A while back I bought an unfinished tray and used chalk paint and decoupage to turn it into something a bit more special. Lately I have found myself being drawn to objects made of brass and gold. For a while I wouldn't even look at something with a gold tone. What's old is new again. 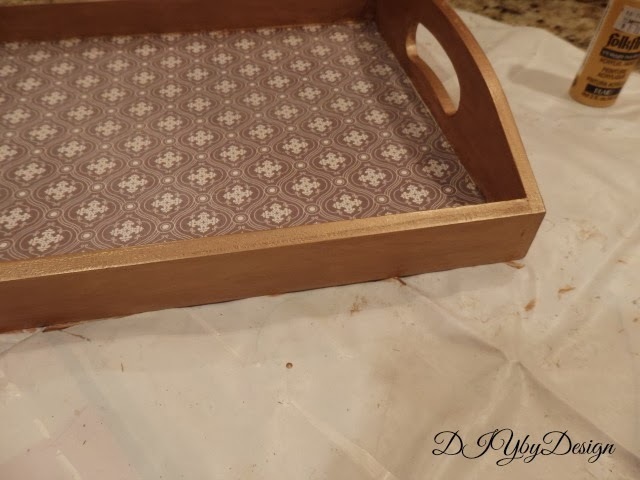 I was debating between gold leafing the tray and painting it. I opted to paint it mainly because I already had the paint in the house and to gold leaf it would have required a trip to the store. I mixed two different tones of gold to get the effect I was looking for. It painted out easily with two light coats. The old scrapbook paper worked fine, but if I was going gold, I really wanted to go gold. 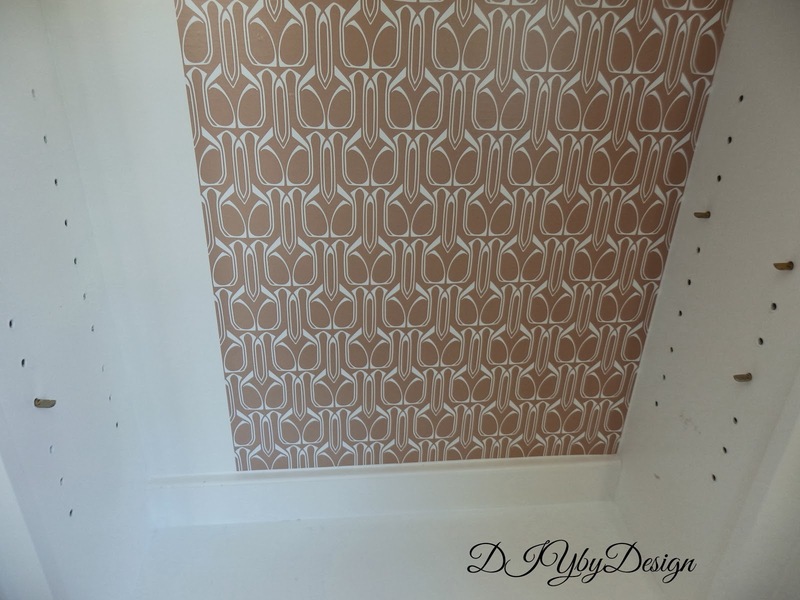 So I added this gold and white geometric print scrapbook paper instead. Here it is after. It looks way more fancy now. 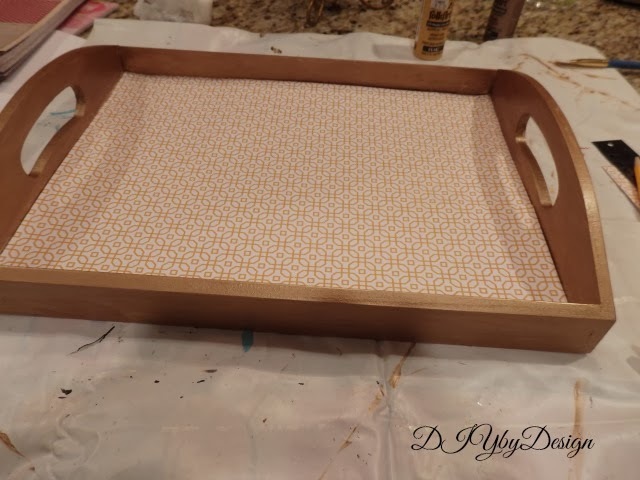 I love how a little paint and paper completely transformed my little tray to give it a much more sophisticated look. Don't forget to stop back tonight at 8pm EST for my Winter Blues Wednesday link party. Happy Monday. My kids were off all last week and had two snow days from the previous week so they haven't been in school in thirteen days. We had lots of fun while they were home, but it caused me to be pretty scarce from the blog world. 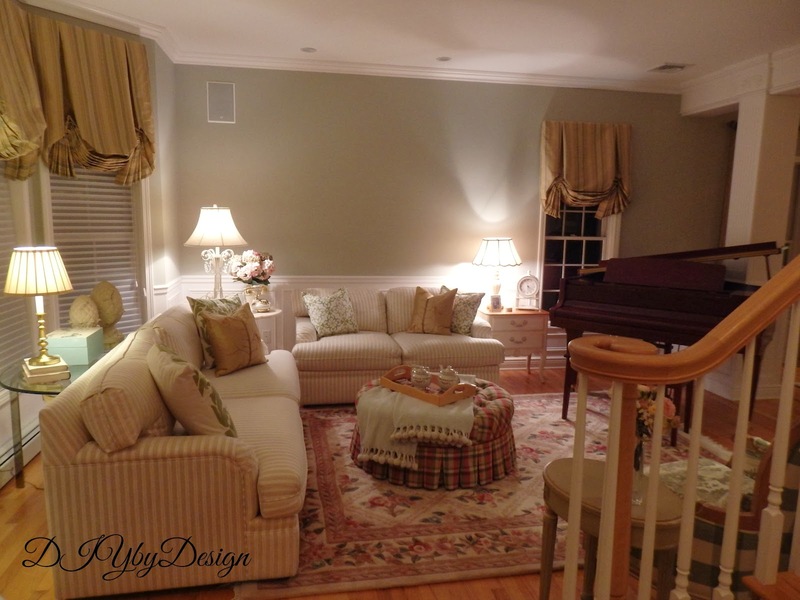 I have been on a mission to find a new area rug for my newly repainted living room. This is when a paint job becomes more than just a paint job. 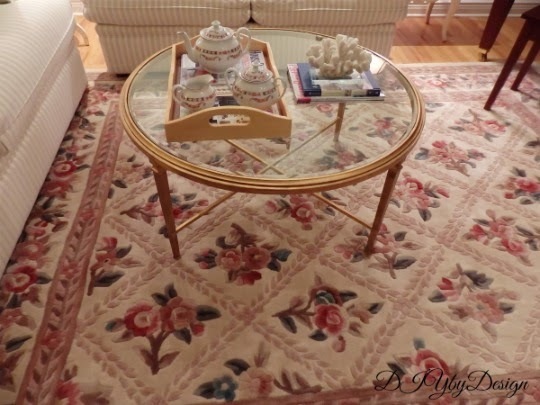 I feel like the current area rug dates the room, so I started a search to find a replacement rug. On my first day out trying to find a rug I came across this rug at Home Goods. 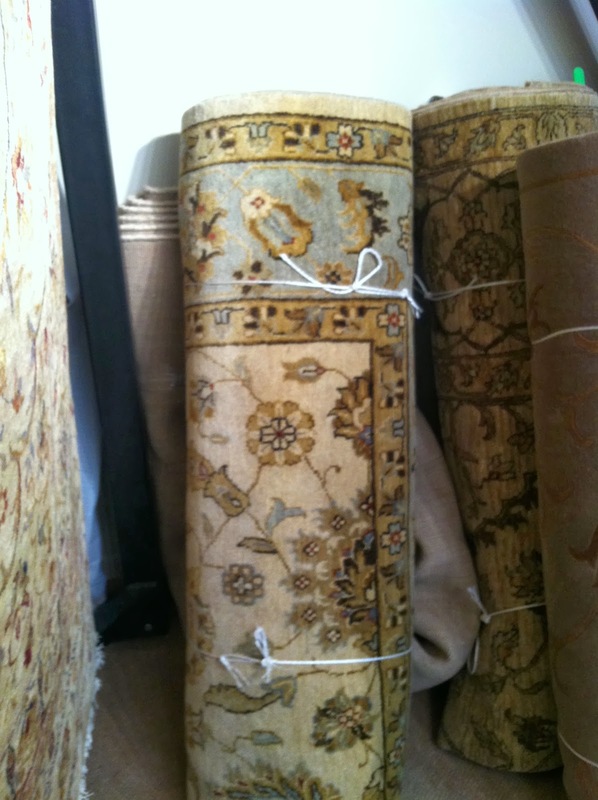 Since it was my first stop, I thought I should look around some more before grabbing the first rug I saw. The colors, the size and the style were pretty spot on. The rug was a steal at $300. However, I debated and decided that I didn't want to buy it and then have to possibly return it, especially since I hadn't searched out the market yet. Now I could kick myself because it's three weeks later and I still haven't found a rug after hours and hours of searching. This is definitely a flaw in my personality. I always feel like I have to search the market high and low until I am satisfied that I have seen everything that could be offered and then and only then do I feel good about my decision. For the record...I typically I go back to the first item I saw. 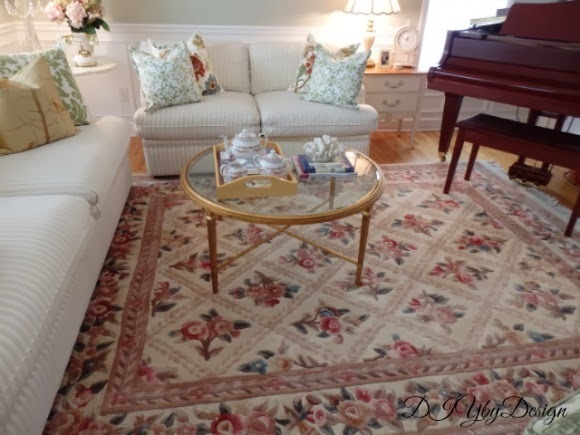 The only other rug that I have found that I love is a one of a kind hand-knotted rug that unfortunately sells for much more than I wanted to spend. 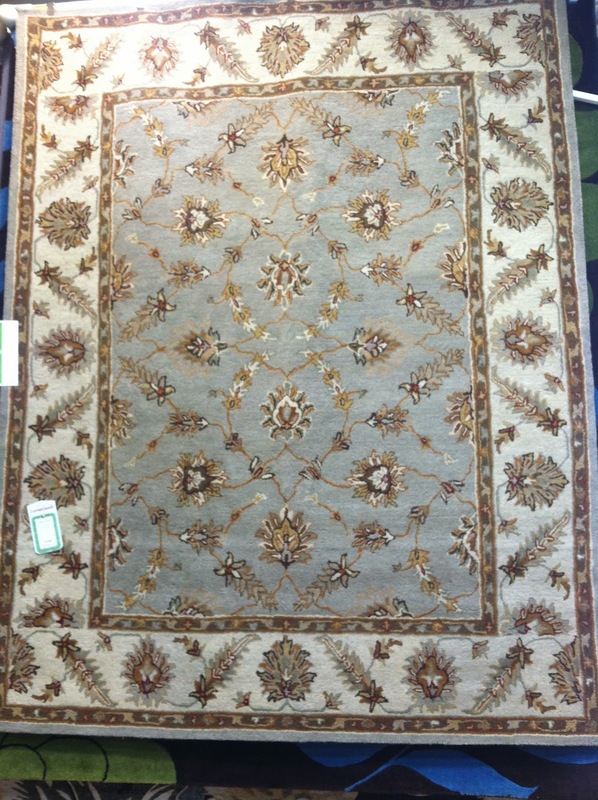 It's a poor quality photo, but the rug is really stunning. Obviously there's a night and day difference between the quality of the Home Goods rug and this rug, but that it reflected in the price difference. Believe it or not, it's actually a great price for this rug. It's a different decision if I get this rug. It becomes an investment piece. We have a gorgeous hand-knotted rug in our great room which we have had for over ten years and love it as much today as the day we got it. 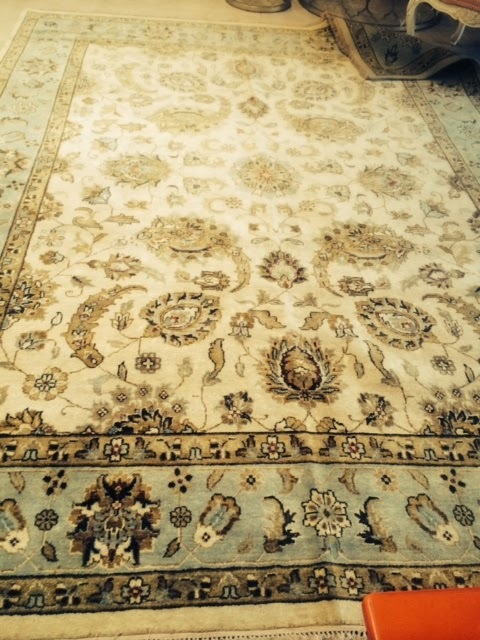 These hand knotted rugs are truly masterpieces taking sometimes more than a year to make. Lesson learned, especially when it comes to Home Goods...buy it when you see it. Home and Lifestyle Design featured the work of Barbara Gilbert Interiors which included this gorgeous bathroom. Be sure to stop read all about Barbara Gilbert's story. Dixie Delights shared her boys room. What a beautiful room. 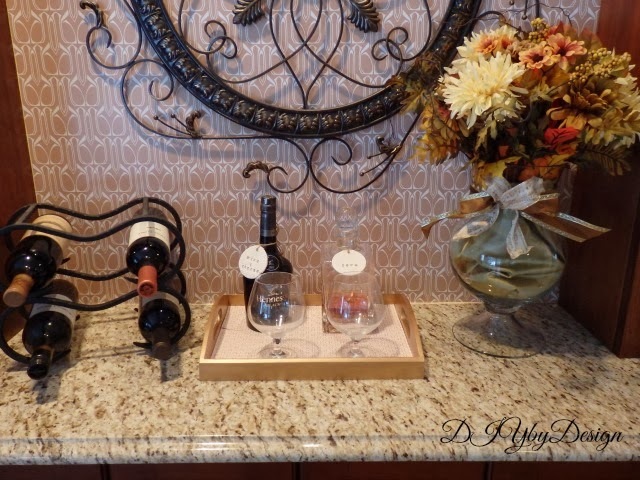 Hope you will stop by to check out all of the details on this room. McCall Manor gives a great tutorial on how to create this super cute personalized desk blotter. So Much Better With Age gives a tutorial on how she created this super cute vintage valentine's day pillow. 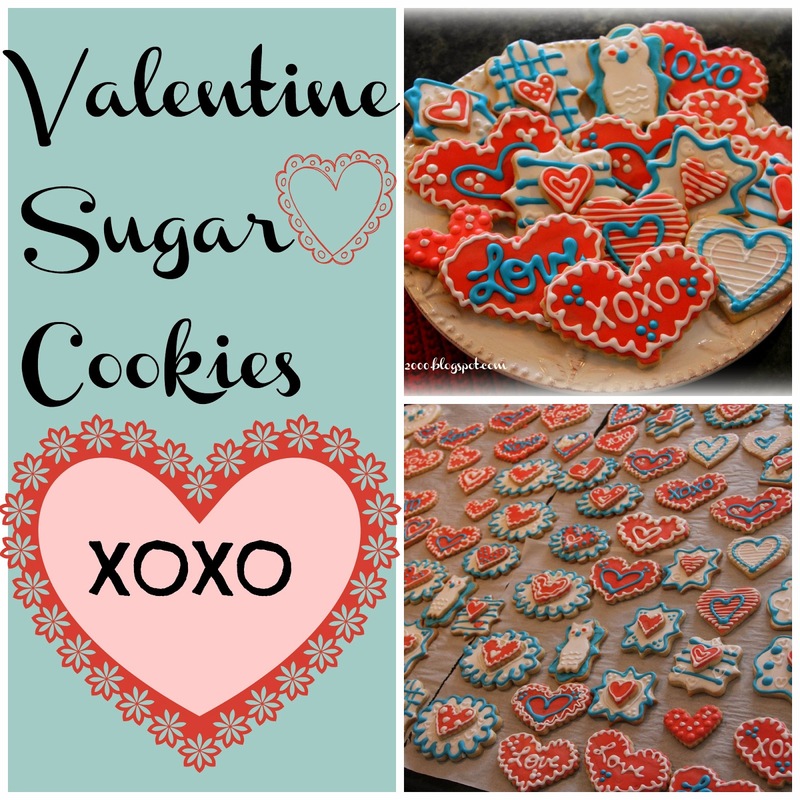 Priscillas shared these adorable sugar cookies she created for Valentine's day. Since the new paint job I've been working on my living room and dining room little by little. I moved this table from the living room into the dining room between the two head chairs. The current table skirt fabric works, but not as well as it used to. The table used to be in the corner of the living room with a burgundy topper, which I have removed. I found a yard of this plaid silk fabric at Calico Corners for under $10 a few weeks ago. Since then I have been leaning toward this being the color scheme for the new dining room. 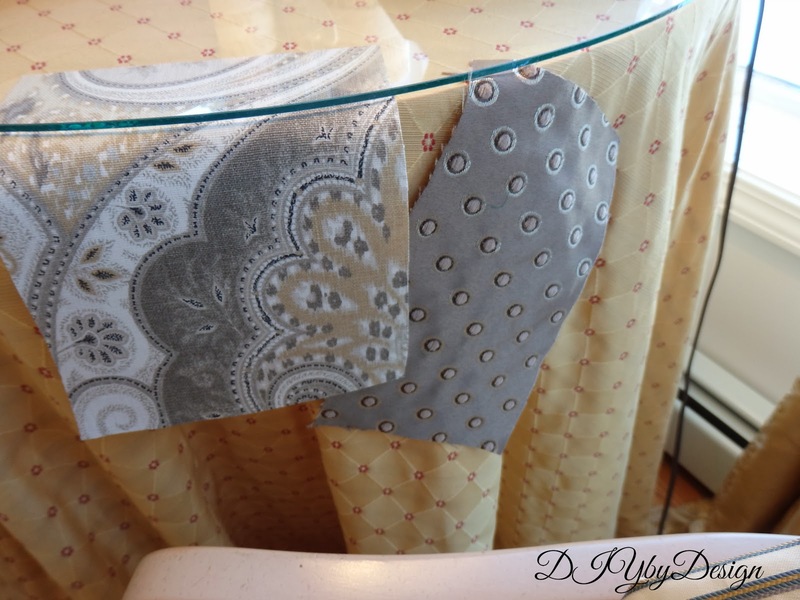 The pewter fabric with the dots would be the main table skirt fabric. It has a good weight to it and would flow well as a skirt. The other fabric is called Latika and is by Kravet and I love it in all of the colors it comes in. 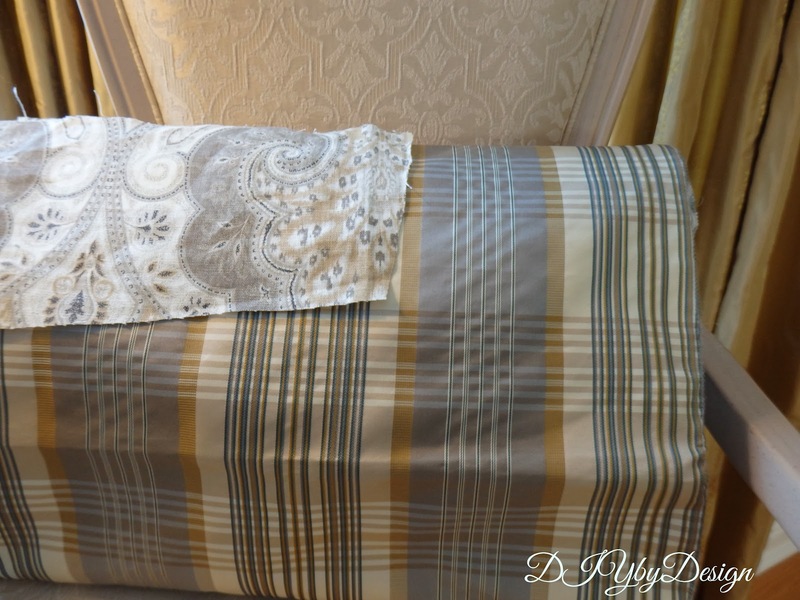 This one seems to work perfectly with the plaid and the pewter fabric. I think a skirt might be the easiest way to go, but I have also been considering a pleated skirt. I still like the idea of a table skirt in the dining room as it gives me a chance to bring in a few pattern and texture to the space. Calico Corners is having a sale plus they sent me a coupon so I may be ordering the fabric tomorrow. My kids are off all week so I hope I have time. While I'm at it, I might buy enough fabric to make a dining room table runner as well. Hope to see you all at my link party that opens Tuesday evening at 8pm EST. It's another snow day here in New York. We really got a ton of snow this time. Being stuck in the house so much has given me a chance to do some little projects around the house that I might not otherwise get around to doing. 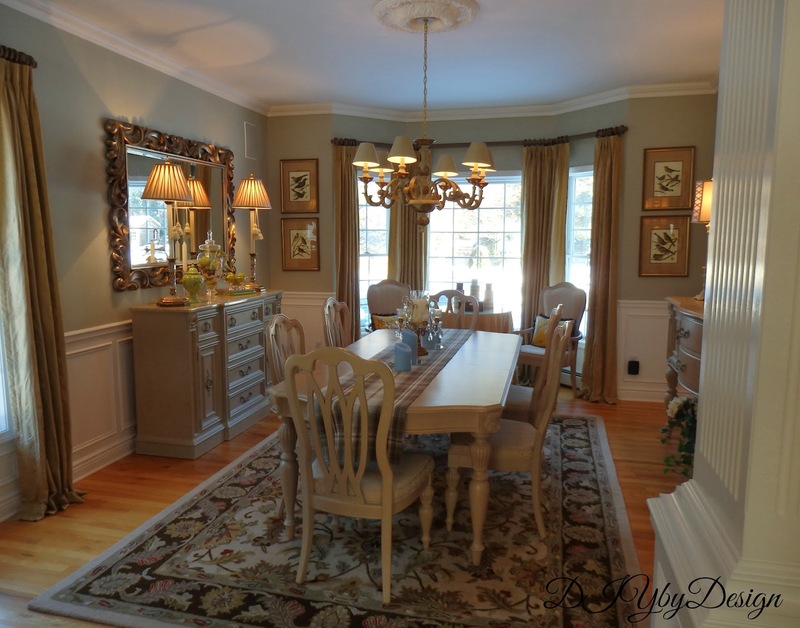 As you know we just painted our dining room a lighter and brighter color. 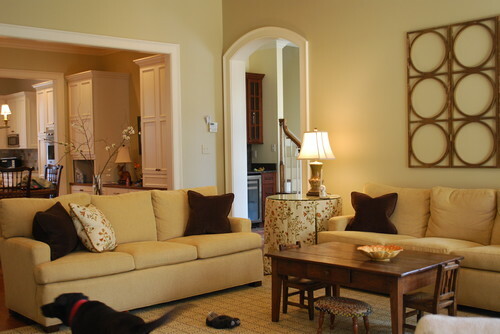 There is a small bookcase built into the columns that separate the living room and dining room. 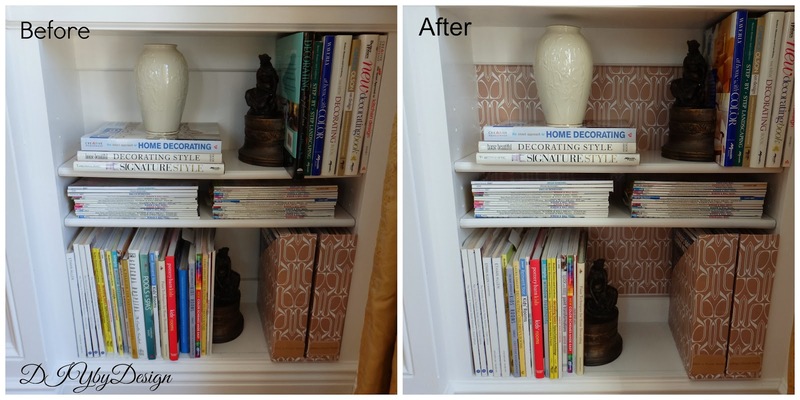 I decided to take the bookcase from ordinary to something a bit more special. I started by emptying out the bookcase. It turned out the bookcase needed a little touch-up so I pulled out the paint and painted the shelves. 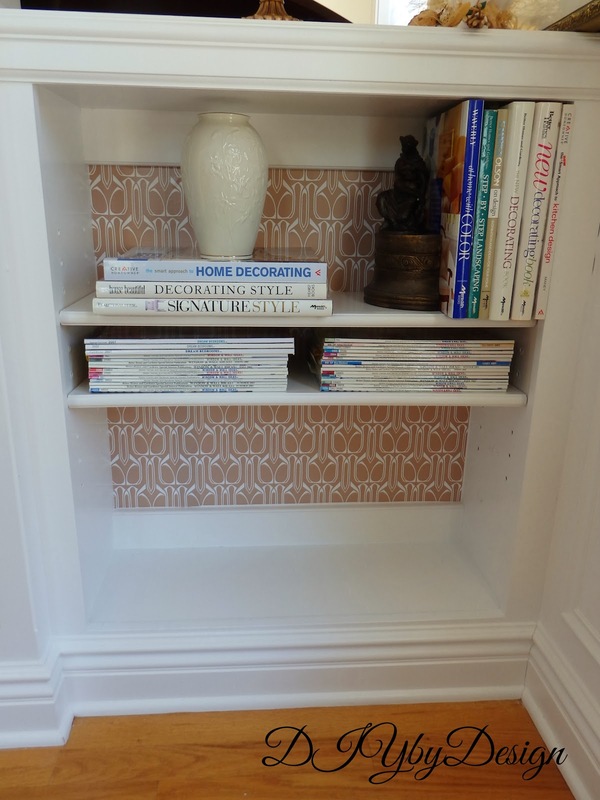 Next I used temporary wallpaper I had left over (which is the same wallpaper that I used to cover the DIY magazine holders). It only took a few minutes for this update. I had already edited what was going back before I decided to add the wallpaper, so it was easy to put everything back. 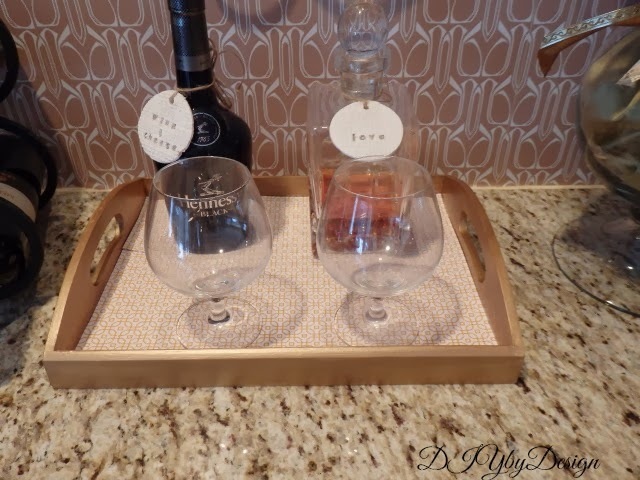 I love easy projects that make such a big difference. 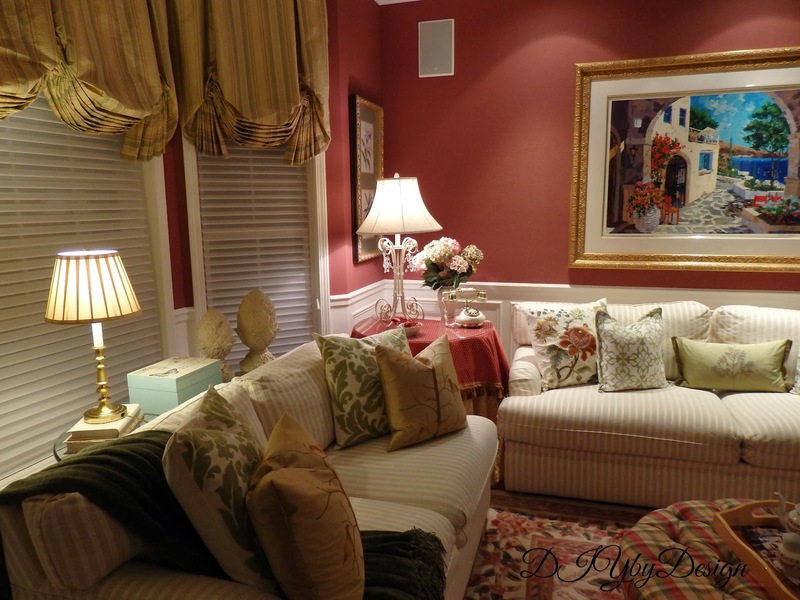 Home and Lifestyle Design shared a tour of her gorgeous home. Be sure to stop by and take the full tour. Setting For Four shared a tutorial for this adorable sweater pillow. Love it! 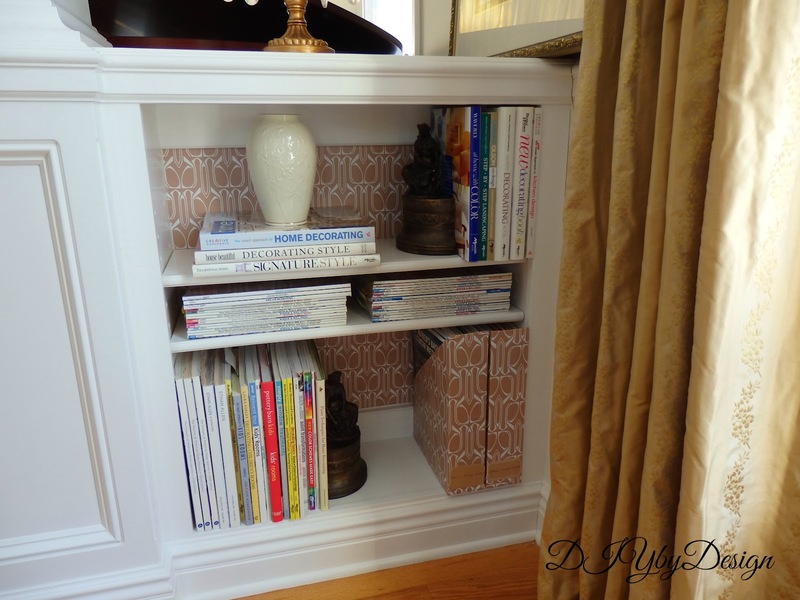 Victoria's Vintage Designs transformed an old french provincial credenza into this beauty. I just love the beachy/coastal look. 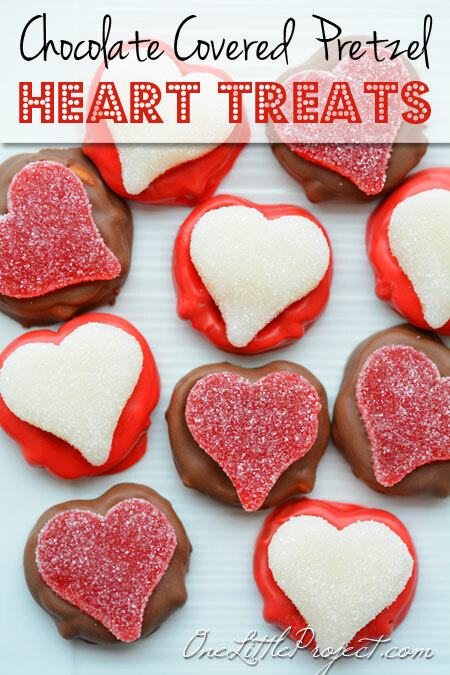 One Little Project shared a recipe for these chocolate covered pretzel heart treats.